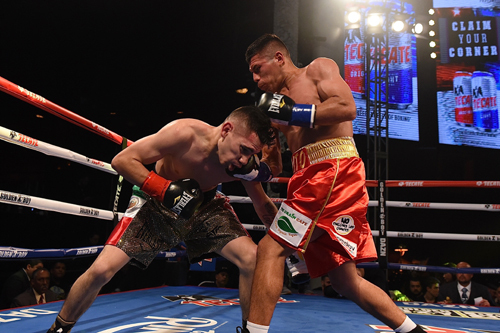 In the main event of the Golden Boy promoted show Mercito Gesta (32-3-2, 17 KO’s) and Juan Antonio Rodriguez (30-7, 26 KO’s) went toe to toe in a punches in bunches affair that saw both men let the leather fly all night long. Gesta appeared to be confident in the opening rounds but a determined Rodriguez stayed focused as he surveyed the landscape. In the mid-stages Gesta was cut and slowing down from the body attack offered up by Rodriguez. 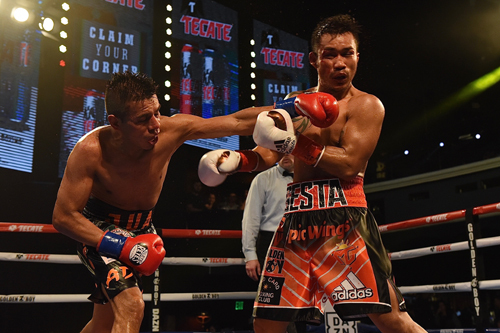 As Gesta tired Rodriguez gained momentum. 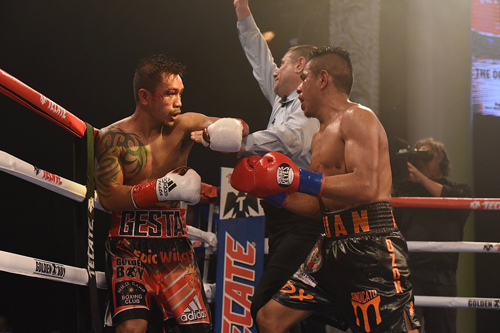 It was then in round eight that Rodriguez seized the moment and with a plethora of hard blows to the body and head Gesta was reeling against the ropes forcing the fight to be brought to a halt. Officially the time of stoppage was at the 2:55 mark of the eighth stanza. 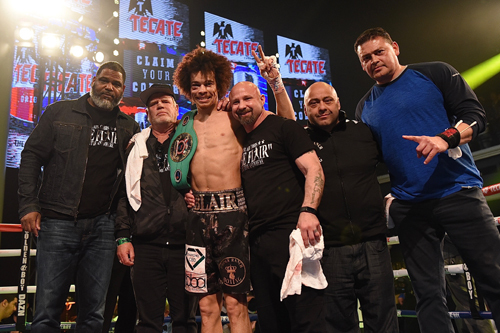 Slugfest…Donnybrook…Barnburner…call it whatever you like, the battle between Welterweights Ferdinand Kerobyan (11-1, 6 KO’s) and Blair Cobbs (10-0-1, 6 KO’s) was one for the books. It was a true battle in the trenches in every sense of the word. 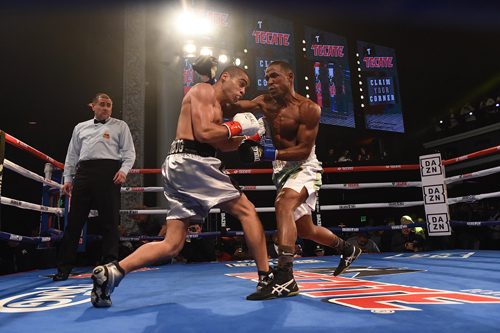 With the NABF Junior Welterweight Title on the line both men came out his blazing. Cobbs would clip Kerobyan early and set the tone for the night. 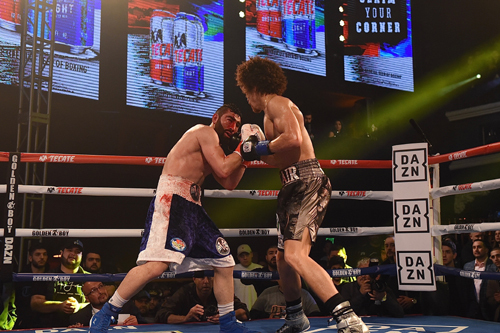 Kerobyan pressed the battle hard but a cut suffered over his right eye in round three became an issue for the Hollywood fighter the rest of the night. Cobbs stayed on the attack and kept the cut Kerobyan bloody for the remainder of the night. Credit to Kerobyan for not only hanging in there all night but to close the show the way he did Kerobyan impressed not only the fans but Cobbs himself who applauded his fallen foes fine performance. Final scores all in favor of Cobbs read 79-73 and 77-75 twice. 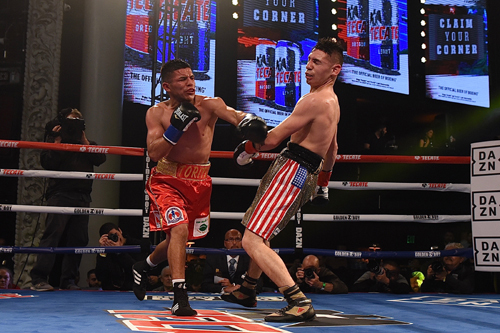 Featherweights Manuel Avila (23-1-1, 8 KO’s) and Jose Santos Gonzalez (23-7-1, 13 KO’s) gave the fans a good old throwback type fight that harkened back to The Olympic Auditorium days. Avila started out the fight looking sharp and in control for the first half of the rounds. 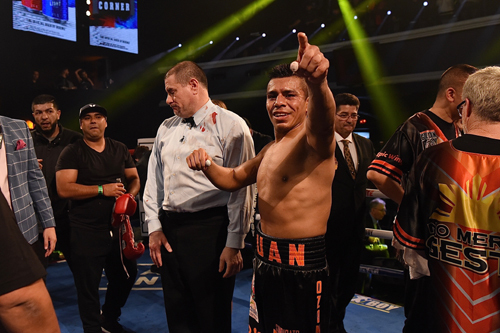 But Gonzalez found a home for his right hand midway through the night and took over from that point on. It was nip and tuck as the final round ensued. In the end the judges scored this one 77-75 for Avila, 77-75 for Gonzalez and 76-76 even. The fight was rightly deemed a draw. 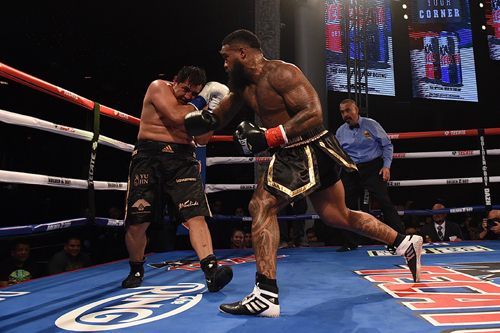 Heavyweight James Wilson (7-0-1, 6 KO’s) was brought down to earth by Miguel Cubos (13-20-1, 10 KO’s) in this fight that ended in a majority decision draw. Wilson came into the ring looking like a Gladiator while Cubos looked more like a burrito killer. Anyone who expected an early KO learned quickly it was not going to be. Cubos mucked it up and took Wilsons best the entire fight. The rendered scores of 58-56 for Wilson and 57-57 twice left this one a draw. Cubos was last seen heading for the Hollywood hot dog carts while Wilson was busy choking on a huge serving of humble pie. 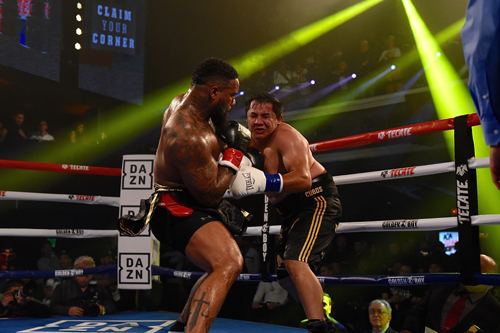 Super lightweights David Mijares (7-0, 3 KO’s) and Antonio Sanchez (6-6, 3 KO’s) took to the ring in a six round affair that was low on highlights. 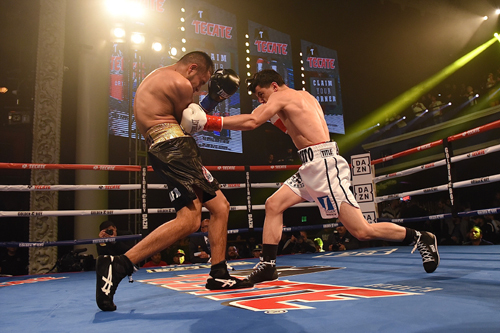 For the most part the southpaw Mijares stayed in control of the bout with a steady but light attack. For his part Sanchez seemed less than willing to exchange at all. That made it easy to justify the scores of 60-54 across the board. 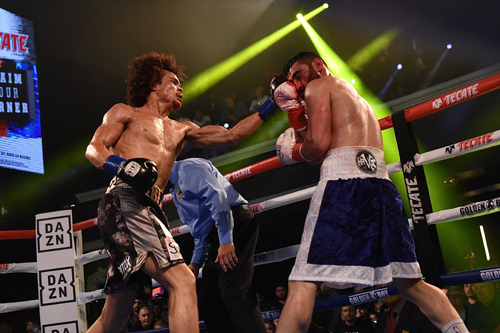 Lightweight Oscar Acevedo (5-0) was forced to go the distance with a tough Daniel Bastien (4-13,1 KO). Truth be told, if Bastien had pressed a little harder from the opening bell he may have pulled of an upset. Although Acevedo’s undefeated record looks impressive his lack of power is going to become problematic. Final scores all n favor of Acevedo read 40-36 and 39-37 twice. 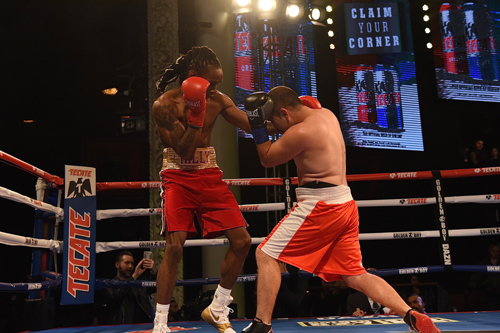 Super Middleweight Chris Ousley (10-0, 9 KO’s) took on a long in the tooth Jorge Luis Munguia (13-15, 5 KO’s) and made quick work of the Ham-n-Egger scrambling his foe at the 1:54 mark of round one.